Some good news for people who need to travel from the East Village to the West Village (or the other way around!) on weekends. Starting next Sunday, the bus will once again operate on a weekend schedule. As you can see on the sign, the M8 will now run from 7 a.m. to 1 a.m. on Saturdays and Sundays. It's part of something called NYC Transit's "2013-14 Service Enhancements Program." 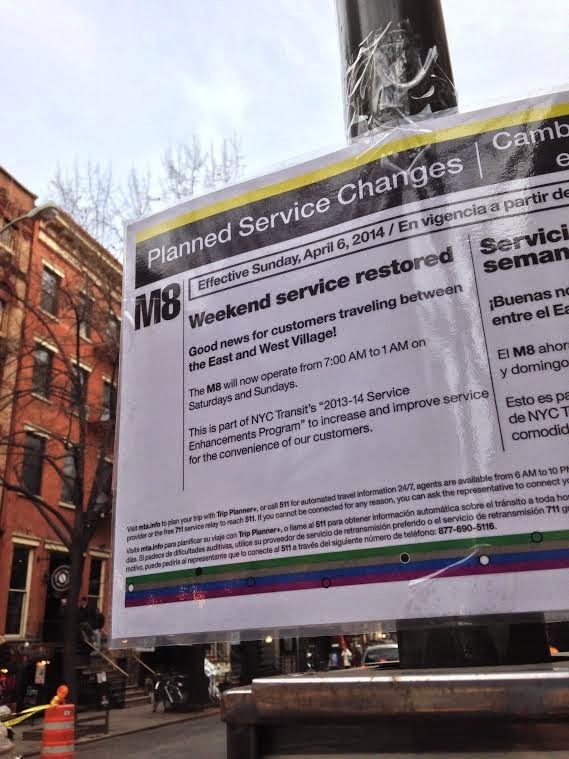 Of course, the bad news is that the MTA has discontinued the M8's weekday service. KIDDING! KIDDING! The weekend service was discontinued in June 2010 to help ease the MTA's $400 quintillion million financial shortfall. Yea!!! I assume this means that we get to get rid of those Weekend "parking spots" that happen in the bus stops...sometimes on Monday mornings there's still a car or two parked from someone who was too drunk to realize they needed to move their car. Otoh...it does mean we've got to get a DOT permit again for re-routing when we have our Block Party. Well worth it, though. I've really missed it. It hurt everyone, both on the East side and West side when they discontinued weekend service. If you remember, the MTA had planned to scrap the M8 altogether, and it was only because of actions—even a demonstration by Rev. Billy—that weekday service was retained. I was thrilled to see the notice yesterday that service would be restored; it wasn't like the M8 didn't have riders on the weekends. I'd really like it if the M9 were restored to its original route. We lost the Avenue C bus after 9-11, so we have in effect lost two bus lines from the far eastern edge of an already subway-underserved area. I miss the m9 too. The M9 *is* still running, which is good for getting down to Battery Park (if that's where you're going). I, too, wish it was back on Avenue B, though. Gojira, what was the number of the bus that was on Avenue C before 9-11? @olympiasepiriot, it was just the M14C. There was the M14A, the M9, the M14C and the M14D. I never see the M9 anymore, know it's still out there but have no idea where it goes, but from what I understand the route is so truncated and the bus runs so infrequently that it might as well not even be there. But there is no reason why the people along B should not have their own damn bus route! I liked having M9 on Ave B, but didn't use it frequently. I have to say I now enjoy the relative silence when I'm in Tompkins Sq Park by Ave B or just walking down Ave B, now that the buses don't go down this fairly narrow street. I do understand of course that some people surely miss the service, especially the elderly in the area. I feel bad for them. Now the M9 runs on Avenue C in our neighborhood. for a while after Sandy (I think, it was recently anyhow), it was from Beekman St. near City Hall to its northern terminus on 1st Avenue around E. 27th near Bellevue. It supposedly has returned to going south to Battery Park City again. I haven't ridden it in a while. It's about once every 15-20 minutes, depending. It runs on the weekends, too. But, seriously happy about the M8 being back!! As a committed bus rider, this has become indispensable. Load the URL on your smart phone or computer. It would great. The M21 ran down Avenue C and accross Houston -- perfect for going to Film Forum. I miss it too. 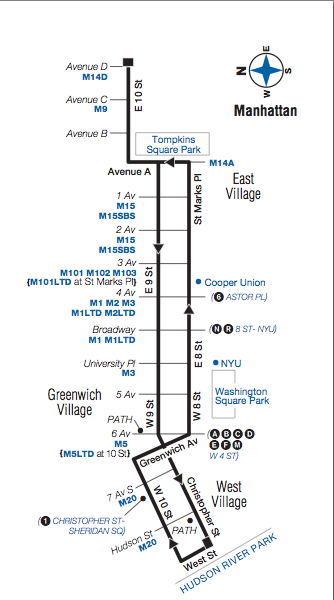 ...I wonder what it would take to get the second ave M15 SBS to stop on St. Marks like the limited used to... the jump from 14th St to South side of Houston is too damm long. A new beginning for Sapporo East? Has The Red Pepper closed on East 6th Street? Report of a late-night fire at 145 Second Ave.
Report of a fire at 279 E. Fourth St.
Only 1 night of celebrating left!